The first things that come to mind when mentioning Moroccan cuisine are Couscous and eating with one's hands. While this isn't wrong by any means, it does however do an injustice to its richness and diversity. Thanks to a wonderful Mediterranean climate and contact with some of the world's greatest civilizations, Moroccans have developped their cuisine into one of the world's most complex and diverse. Moroccan cuisine’s greatest characteristic and its most notable contribution is its ability to masterfully mix opposing flavours and diverse ingredients, creating a rich and memorable gastronomic experience. Rich, sweet, salty, zesty; Moroccan cuisine effortlessly mixes these flavours understating the complexity of its recipes and methods of preparation, carefully honed over centuries. 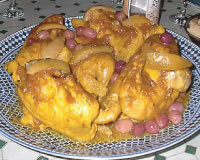 Moroccan cuisine has long had a reputation of being one of the world’s most diverse and developped cuisines, and has been gaining tremendous popularity around the world as of late. Moroccans take such pride in their food because it serves as the backdrop for a gathering of close friends or relatives. Moroccans love hosting and usually prepare feasts composed of entrees, multiple dishes and finish with mint tea and cookies. A traditional Moroccan meal has the guests sitting around a circular table (on a carpet, pillows, or Moroccan leather “pouffs”), eating with their hands from the same tajine. The sharing of the meal brings people closer during a feast and accordingly, has an etiquette all its own. One should only eat from his section of the plate (directly in front of him) and always with the right hand. The most important part of a Moroccan meal, however, is that it be shared in good company. 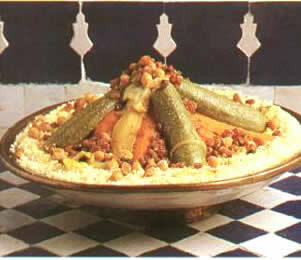 The Moroccan national dish is couscous with seven vegetables. 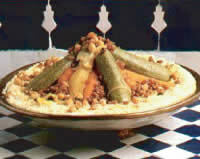 Couscous is a small grain sized "pasta" made from wheat semolina flour. 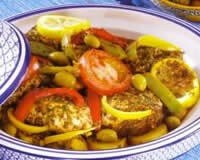 Every vegetable adds an important dimension to this famous dish. Lamb or mutton is most commonly used in this dish, but chicken can also be used. 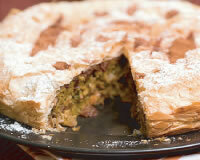 This rich and sweet dish uses tender lamb, complemented by sweet dried plums. 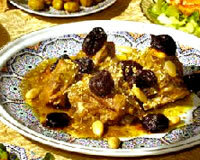 The roasted almonds add crunchiness and texture, adding to the complexity of this famous tajine. A classic Moroccan dish. The beauty of this dish lies in its simplicity, allowing the contrast of the lemon and olives with the chicken to be fully appreciated. Traditional Moroccan soup. It has a rich and complex taste with light notes of zest and a slight bitterness. Chunks of lamb are slowly simmered in a seasoned broth of celery, parsley, onions, tomatoes, coriander, chickpeas, lentiles then thickened with eggs. 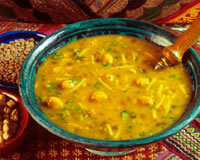 This rich soup has many nutritious ingredients and is a cornerstone of the breaking of the fast (iftar) during Ramadan. This dish epitomizes the art and complexity of Moroccan cuisine. Conoisseurs consider this to be the apex of Moroccan, thanks to its masterful blend of sweet almond paste and roasted chicken (or pheasant for the more luxurious variation) wrapped in its many layers of thin, crispy, golden sheets of pastry, topped with sugar and cinnamon. Mint tea, the quintessential Moroccan drink. Mint and sugar mask of the bitterness of the green tea to varying degrees, depending on tastes and the region where the tea is being served. 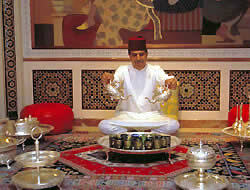 The preparation and serving of mint tea in Morocco is an intricate ceremony usually culminating a feast or for a Moroccan snack. Tea is served with Moroccan pastries, a diverse part of Moroccan cuisine. Moroccan pastries have many different shapes and tastes. Moroccan pastries are usually based around honey, almonds, sesame and figs. Briouat are little triangles with a sweet almond paste wrapped in thin sheets of dough and dipped in honey. Chebakia looks like a more intricate, thinner and smaller pretzel, dipped in honey and sprinkled with sesame seeds. Fekas is very similar to Italian biscotti, except smaller.